We ordered a load of topsoil for the hoop house in spring. We used part of it right away inside the new structure. 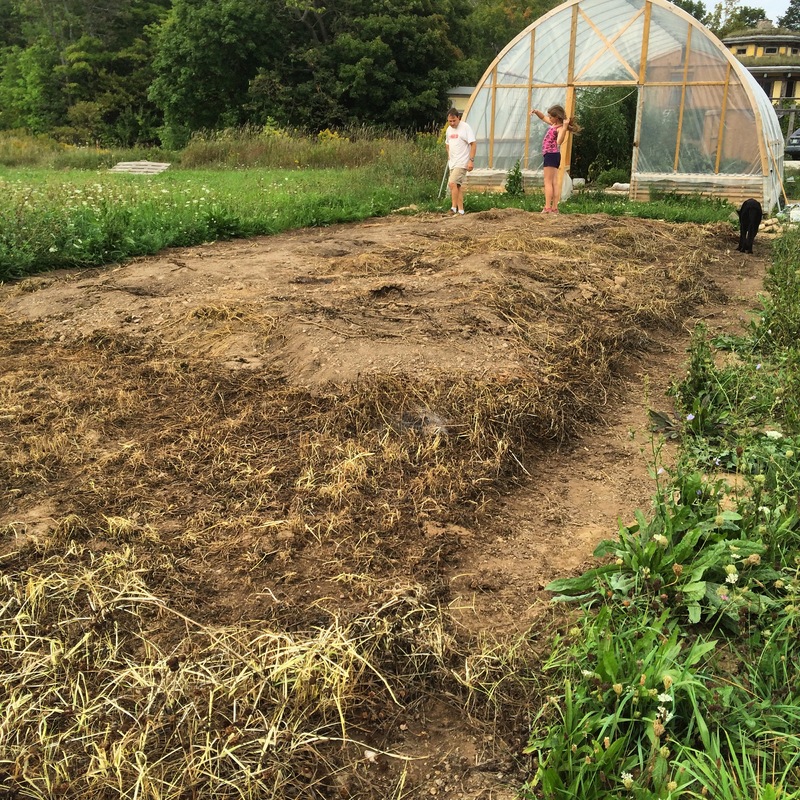 The rest of it went to the future site of the hoop house – where we will move the hoop house when the time comes. Don’t ask when that will be. But we will be ready. Spring was rainy. It didn’t take long for that beautiful top soil to green up with wild mustard, shepherd’s purse and a few other characters I’d rather not have in my prime growing areas. It’s not that I am anti-weeds across the board. The only things I remove immediately are bindweed and ragweed. All plants have their roles to fill in the ecosystem. I’d just rather not be spending time and energy removing their progeny in the years to come. These chickens really went to town on the greens that were imported in our topsoil delivery. Within two weeks, the ground was bare and their bellies were full! 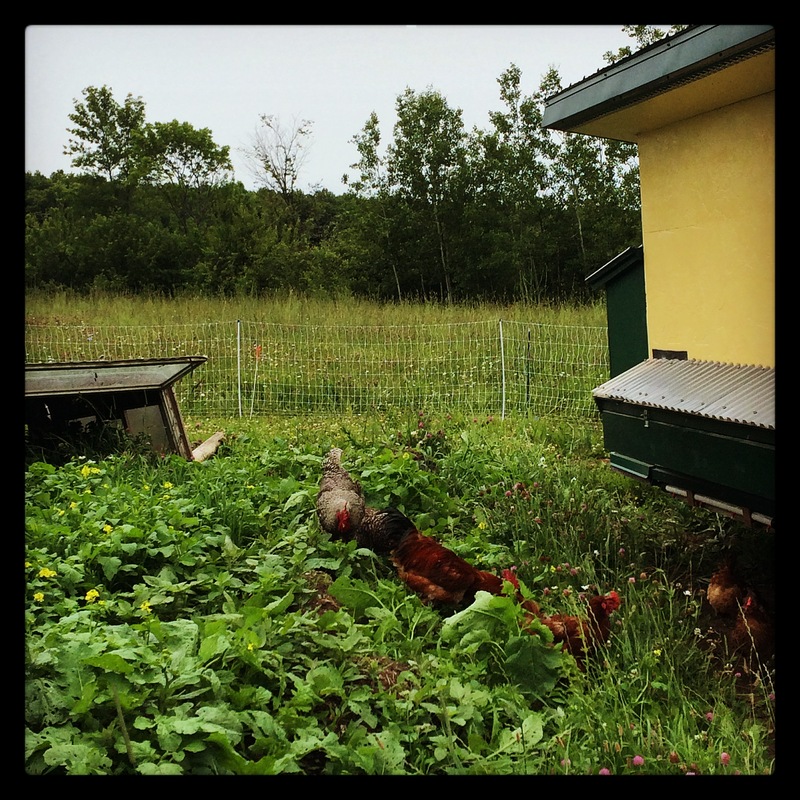 With their scratching, pecking and dust-bathing the chickens reduced the green forest to bare soil in short order. They really seemed to have fun doing it too. At first it was like a big game of hide and seek as the plants were as tall or taller than the birds. As things thinned out, some plants continued to grow taller but had no lower leaves; almost looking like palm trees. The only plants left at the end of their session were goldenrod and chicory; perennial plants that were there before the topsoil delivery. 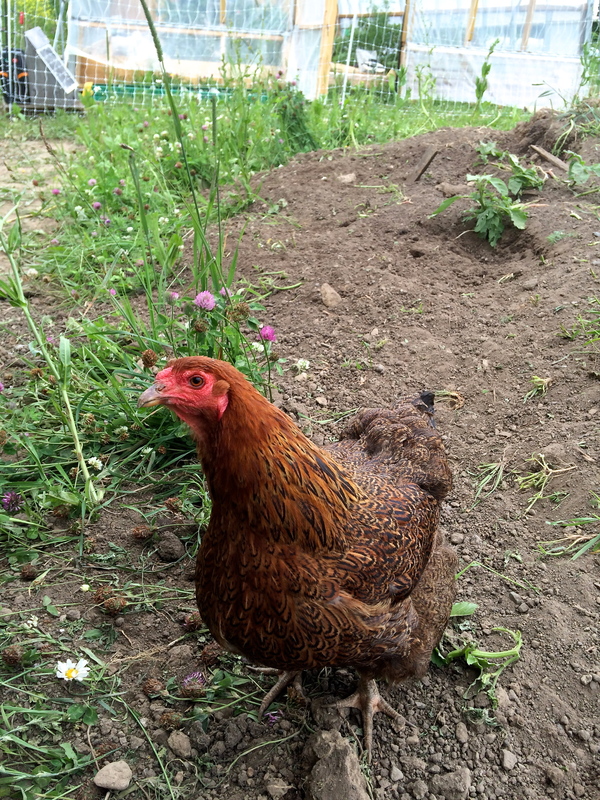 This partridge chanticleer and her flock cleared the ground for the future site of the hoop house by the end of June. Then it was time to move the chickens to new pasture. To keep the bare soil from growing more of what we didn’t want, we laid a tarp over the area. A BIG tarp. That was a family bonding experience that was not so fun. Dusk, everyone tired from a long day, bugs… But we managed. 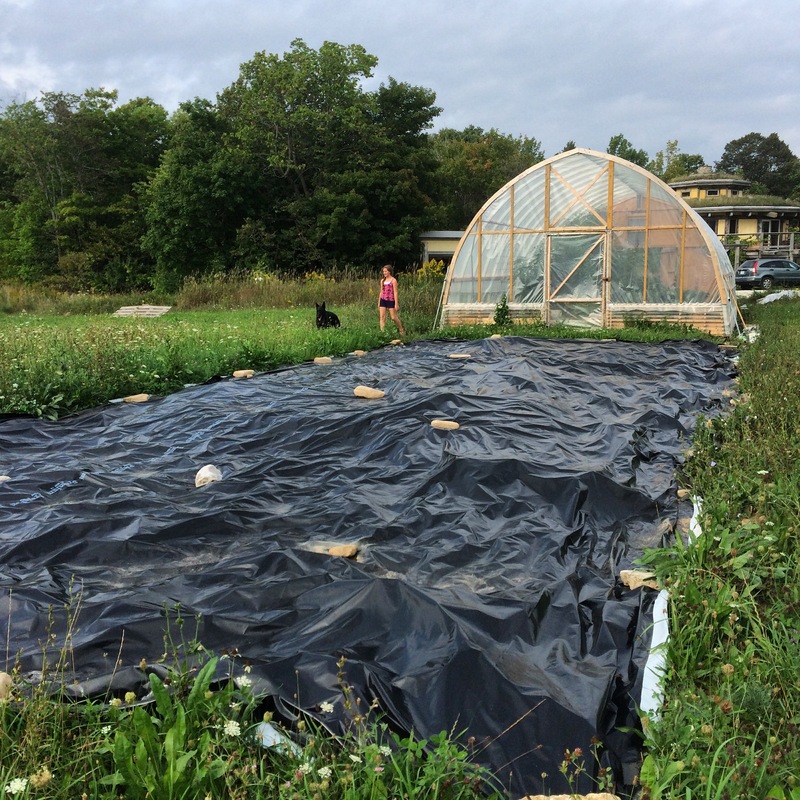 A large agricultural tarp covers the future site of the hoop house. Leaving it on for several weeks helps us prepare a seed bed for our cover crop. We left it on for the recommended time. When it was time to peel it off, we were pleased to see a decent site to seed a cover crop into. There were some grass runners to remove. We leveled it out a bit more and scraped the dead material to the side. The dog managed to find petrified chicken poo to investigate. Below the light-blocking tarp, there doesn’t appear to be much vegetative activity. You can still see the little dust baths that the chickens made. Sept. 7, 2015. Then it was time to sow the seeds of a cover crop. Plant material that would grow quickly, out perform the weeds and add nourishment to the soil. For fast growth we chose oats. Buckwheat is also a fast grower, but we were pushing optimal planting season for it. We tried it anyway. White clover fixes nitrogen and we fling it about like confetti here so in it went as well. Also we added a handful of seeds of unknown age from previous years’ cover crops: vetch, tillage radish, older buckwheat, red clover and rye. Twelve days after seeding with clover, buckwheat and oats. Decent rain helped things along. Sept. 20, 2015. 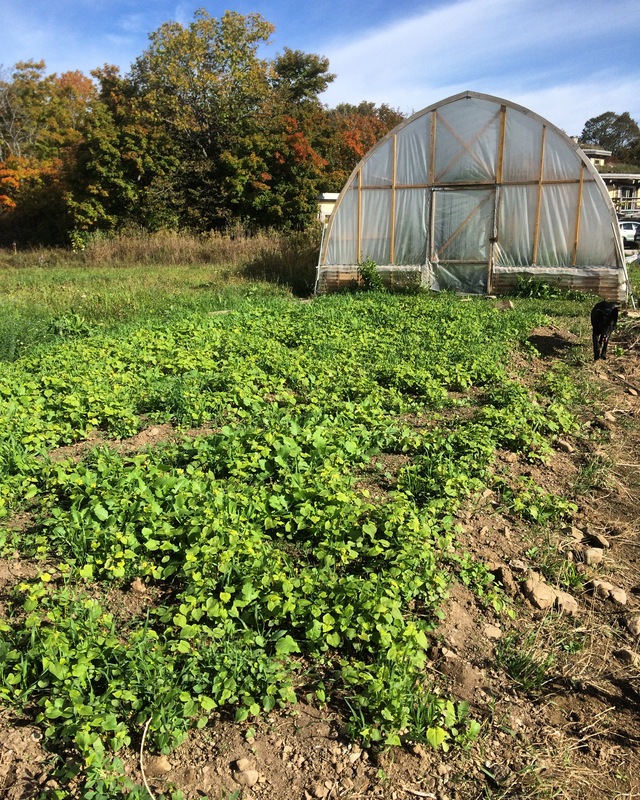 One month after seeding, the cover crop is looking good, growing into a nice blanket to protect the soil over the winter. The heart-shaped leaves are buckwheat. October 8, 2015. 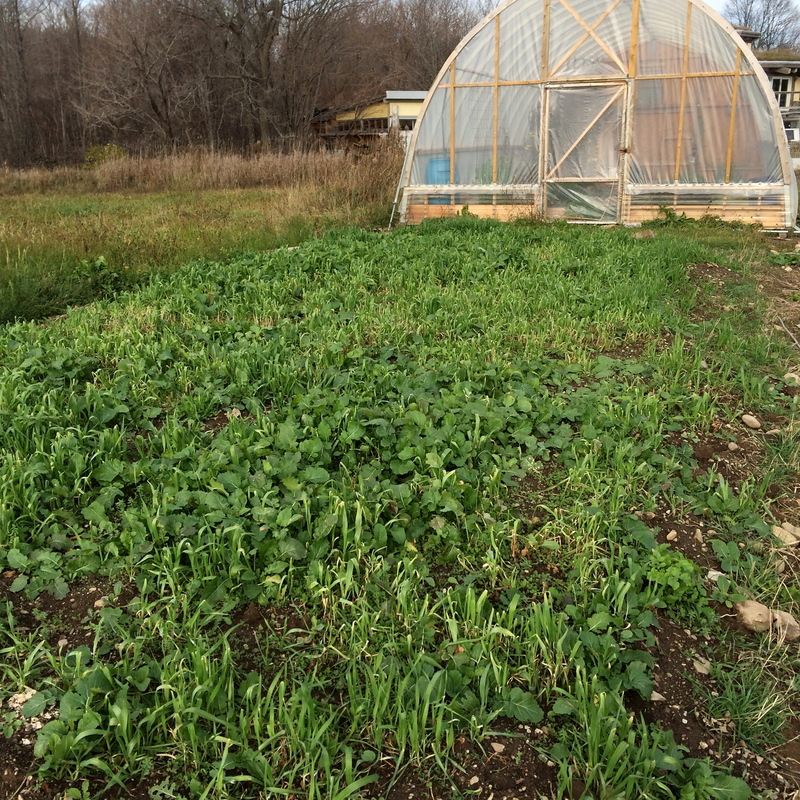 The cover crop has been growing well. It should provide a protective layer over the soil this winter. Most of the material will be winter-killed and add organic matter into the soil. 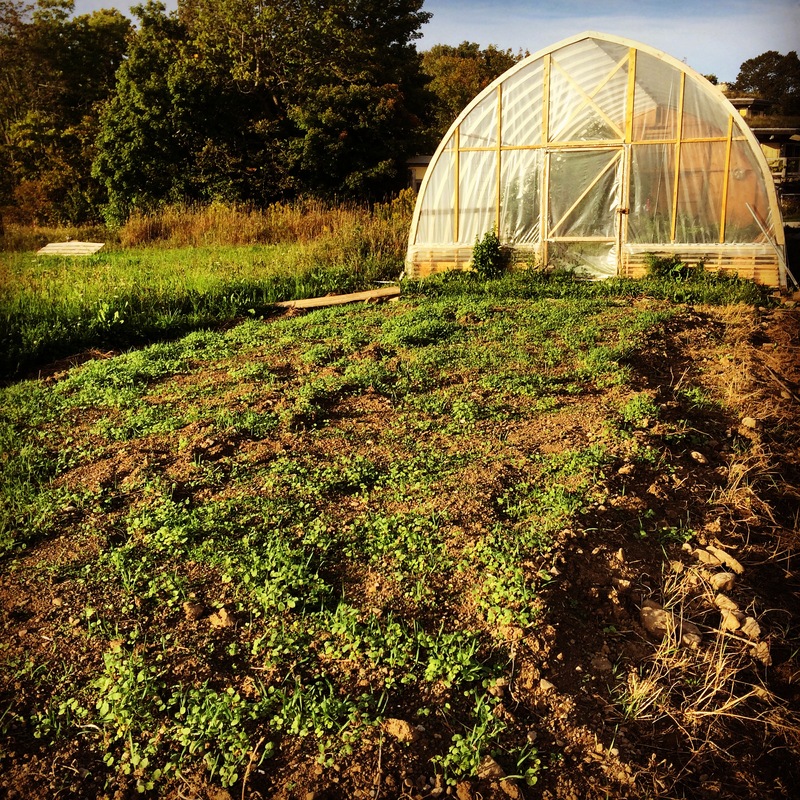 This coming spring we will decide between another round of cover cropping and chickens or seeding with a vegetable crop. Even though the cold weather has taken out the buckwheat, there is still good cover over the soil. Tiny clover seedlings are coming along. November 2, 2015. I think I still see some mustard seedlings in there though. wonderful reading Erin! I have forwarded this on to some of my friends and family who I think will enjoy it too! Thanks so much, Linda. I appreciate your interest! Hope you are keeping warm on this blustery day.